This freestanding washing machine from Flavel is packed with programmes. Coming in a classic white finish and measuring 84(H) x 60(W) x 44(D), it will fit into any kitchen effortlessly. It’s even exclusive to Euronics and Agent stores, so you won’t find this model anywhere else. 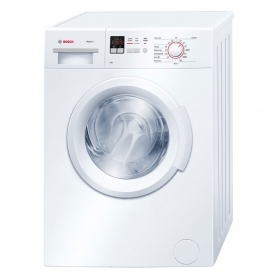 The WFA6100W has a 1000 rpm spin speed – ideal for washing your everyday items. It also has an impressive ‘A’ rating for wash efficiency to clean your laundry as effectively as possible. A drum size of 6 kg makes this Flavel model ideal for smaller households with modest laundry piles. And, a 30 cm porthole makes it easy to load and unload the machine. Clean a full 6 kg load in less than 30 minutes thanks to Daily Quick Wash. This gets your clothes washed in less time – perfect for hectic households. Another great feature for families is Delay Start, which allows you to set a convenient time for the cycle to begin within nine hours. Washing machines keep your clothes fresh and clean, but bacteria can build up in the drum over time. Thanks to a Drum Clean programme which cleans your machine at 70°C, you can enjoy hygienic washing with this Flavel machine. The WFA6100W has an easy-to-use control dial and buttons. The control panel even has a child lock function – great for homes with curious children. Once the cycle has started, it uses LEDs to indicate the wash’s progress. 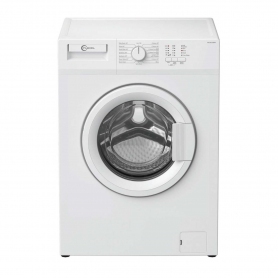 This high-quality washing machine is the perfect choice for smaller homes with big cleaning needs. Why not add one to your basket today?